In June, 2001 I attended a UN conference on Basic Space Sciences in Mauritius. I had a chance to see the island during this visit and here are some of the pictures. 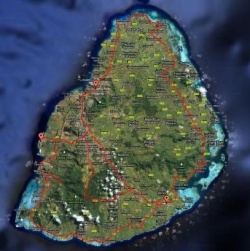 Mauritius is a fairly small island in the Indian ocean, about 1,000 km (600 miles) east of Madagascar. It is about 40 km (25 miles) across at the widest part and 60 km (37 miles) north to south. For its size it has a fairly large population of almost 1.2 million, which makes for pretty congested traffic conditions in a lot of places. The island is mostly agricultural. It seems as if there is nothing but sugar cane fields on Mauritius. The island was home to the extinct dodo bird, as well as several other species that have been exterminated. The dodo was killed off by humans for food. Many other species were exterminated by introduced animals like the mongooses and the rats. Today there is only one small valley left with indigenous flora, and even there you can see eucalyptus trees, which certainly are not indigenous. A few of the indigenous species (most notably the Mauritius kestrel and the pink pigeon have so far survived, but are still in danger in spite of conservation efforts. Mauritius is surrounded by a barrier coral reef. I did get to do one dive on the coral reef. It is nice, but by far not as spectacular as some other reefs that I have seen. 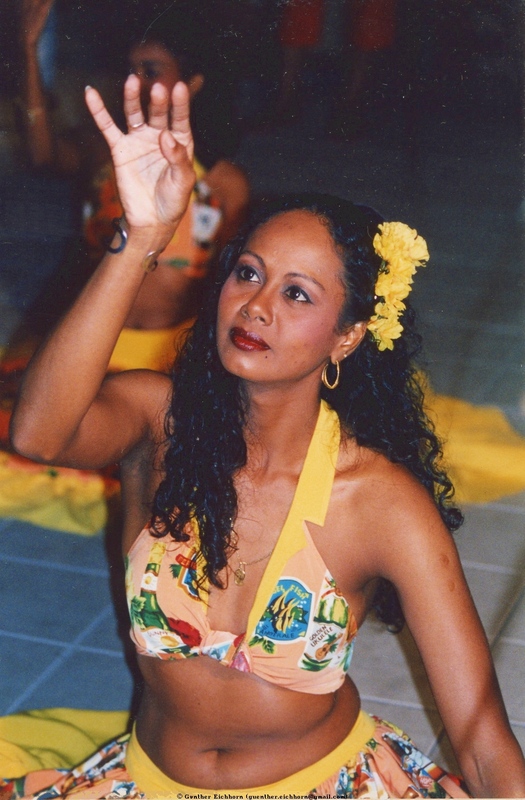 One interesting native Mauritian custom is the Sega dance. It is a dance that started among the slaves in the 18th century. It is a very sensual dance, accompanied by 3 instruments, the Ravane, the Maravane, and the Triangle. It is very interesting to watch. The Mauritians are reasonably friendly, but not overly so. The service in restaurants and hotels was lousy to say the least. I was not at all impressed. You would expect better service in a country that depends quite a bit on tourism. The country is interesting to visit for a few days, but I would not want to spend a longer vacation there. But that is probably because I like to see different things and not just spend my time on the beach. After driving around the island for 2-3 days you have seen enough sugar cane fields and know every last part of Mauritius. Following are some pictures from my Scuba diving trip. I had a regular camera, not a single-lens-reflex camera. Since I was using that camera for the first time, I had a lot of problems with the parallax between the view finder and the objective. But some of the pictures came out OK. Following are some pictures that I took during a Sega dance show. It is a very lively and sensuous dance. Following is something related to the professional part of my trip. Mauritius has a radio telescope. It is not one of the dishes that you may be used to, it operates at much longer wavelengths (2 m (7 ft)) and is composed of 1000 individual dipole antennas arranged in a T-shaped array with the top bar of the T about 1 km (0.6 miles) long and the stem about 500 m (1,640 ft). The signals from 4 of the individual antenna dipoles are combined to gain sensitivity. These combined signals are then sent back to the control center where they are combined to build an image of the radio source.